A team of researchers from Masdar Institute are harnessing graphene’s unique and valuable properties of strength and electrical conductivity to assist the progress of technologies related to local industries like desalination, gas and oil. Such a project is co-led by Dr. Irfan Saadat, Professor of Electrical Engineering, and Dr. Amal Al Ghaferi, Assistant Professor of Materials Science and Engineering. They are using carbon nanotubes and graphene to create smart sensors for use in gas and oil pipelines. The project forms a part of a partnership with ADNOC and the Petroleum Institute and aims to identify and scrutinize the build-up of impurities or scaling within oil and gas pipelines. The graphene market is still relatively new and in the early stages of development with only a few products being commercialized to date. However, strong growth of graphene and other related 2-dimensional materials is expected due to superior strength, weight, conductivity, and transparency properties. That is why Masdar Institute is working to utilize graphene to develop new membranes, sensors and composites. Dr. Steve Griffiths, Vice President for Research and Interim Associate Provost at Masdar Institute. Carbon nanotubes and graphene were applied to create the scale sensors using two diverse synthesis techniques. These sensors will ensure that gas and oil plants function at enhanced levels, thus recovering additional oil from their pipelines. This will optimize the functional efficiency of the UAE’s gas and oil sector, which is a critical aspect of the economy. Given that graphene is a 2D material, it has very unique properties that are not available in typical bulk-3D materials. These include the fact that it is highly conductive, very strong, thermally conductive and transparent. They also are inert and chemically and thermally stable, which opens a wider window for hostile environment applications. Graphene is composed of an individual layer of carbon atoms. Its exclusive structure comprises a repeating pattern of hexagons, which offers certain unique electromechanical and physical properties. It is known to be the toughest material in the world. The electrons travel so rapidly through graphene that they look like there are massless. These properties cause a material to attain the power to revolutionize computing, electronics, and several other technologies. Dr. Al Ghaferi and Dr. Saadat are also offering their expertise to a joint graphene research project with the University of Manchester, which is headed by Dr. Ibraheem Almansouri, Assistant Professor of Microsystems Engineering at Masdar Institute. The University of Manchester is credited to have discovered the wonder material - graphene. The joint project is studying the application of inkjet-printed graphene micro-sensors that can be applied in the energy applications aiming at the gas and oil sector. By taking advantage of inkjet printing, which is a fairly inexpensive and mass scalable material production technique, this project aims to make the method of fabricating graphene sensors simple, economical, flexible and portable. The success of fabricating these inexpensive and flexible sensors relying on the favorable properties of graphene will expand the application domain upon the completion of this project. The collaborative research project focuses on "pre-competitive" study in graphene and associated 2D materials for membranes, sensors, and composites for the defense, energy, and aerospace markets. 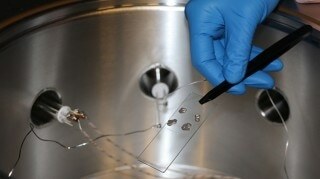 Graphene also possesses the potential to enhance the method used in UAE to produce freshwater from seawater. Veolia, a French environmental resource company, has sponsored a project led by Dr. Linda Zou, Professor of Chemical and Environmental Engineering, to harness graphene’s exceptional electrical properties to optimize the efficiency of capacitive deionization (CDI). CDI is a desalination technology where an electric charge is applied to eliminate salt from water, which is potentially a limited energy demanding desalination method than those that depend upon chemicals, heat or high-pressure membrane systems. Students at Masdar Institute are also assisting in the progress of the applications of graphene in key UAE sectors and real-world issues. MSc graduate and current PhD student Chia-Yun Lai’s Master’s thesis research involving the classification of the surface wettability of fish scales and graphene gained considerable attention from the scientific society. Surface wettability can be defined as the ability of a liquid to sustain contact with a solid surface. It is significant in numerous applications relevant to the industries targeted in the UAE, including progress of electronics, plastics, and semiconductor wafers. Lai’s research was conducted under the guidance of her faculty advisor Dr. Matteo Chiesa, through which she created a unique wettability examination method and analyzed its ability to examine wettability of graphene and fish scales at the nano level. Her research led her to be a part of the first investigators around the world to determine the association between varied length-scale wettability measurements for enhanced spatial resolution. Her research effort translated into five published papers - four peer-reviewed journal papers and one conference paper. Apart from composites and sensors, graphene is projected to be vital to the next set of advancements in aviation components, wearable electronic devices, radiation-resistant coatings, broadband photodetectors, and energy storage. According to a study in ‘Graphene Markets, Technologies and Opportunities 2014-2024,’, the demand for commercial graphene will increase from about US$20 million in 2014 to over US$390 million in 2024.